Would it be possible to create a seismic shift in our spiritual perceptions just through music and art alone? I posed this question to David Young, 58-year old musician, composer, artist and now religious provocateur. David maintains that Jesus, still barely alive, was taken down from the cross by a sympathetic Roman soldier who then helped Mary Magdalena, Jesus’ wife, hide Jesus in a cart with hay and escape to a small town in France. 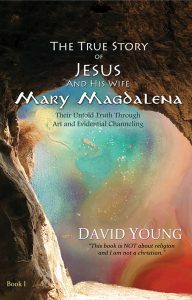 In Saint-Maximin, in the south of France, according to David’s sources, Jesus and Mary Magdalena lived in a cave while Jesus healed from his wounds. Jesus and Mary allegedly had three children that they left behind in the care of Mother Mary in Jerusalem—because it was too dangerous to try to take them along–and they had a fourth child in France, named Sarah. David attributes his inside information to a series of ongoing revelations provided to him by individuals who attended his music workshops and experienced direct contact with their deceased relatives as well as with Jesus, Mother Mary and Mary Magdalena. Other eye-opening data was subsequently transmitted to David by professional channelers, including a former girlfriend named Mimi, enabling David to have direct access to Jesus and Mary Magdalena and even dialogue with them. Considering the power of Christian believers around the world, estimated at more than a billion, don’t you think most of them will be highly skeptical about these revelations? I ask David. I promised him at the very beginning I would not spare my own skepticism during the interview. Born to a traditional Jewish family, David went to Hebrew school from age 10-13 and then celebrated his Bar Mitzvah. He grew up in a predominantly Jewish and Italian neighborhood in Brooklyn. He did socialize with Italian Catholic youngsters and played sports with them, he recounted, but he never had religious conversations with them. That was a taboo subject, he explained. And in his home, he and his brothers were never allowed to say the name of Jesus. He briefly dated a Catholic girl in high school and once she convinced him to attend a mass at her church. “I remember being afraid to go into the church,” he recalls. When he was 22 he left Judaism behind and embarked on a spiritual path with an Eastern orientation. “I quit drinking and smoking completely. I didn’t even have chocolate for 30 years. I was deeply immersed in that community, fasted every Friday, and used to play music with more than 3,000 devotees in the audience. “Why you, rather than someone else?” I ask. David acknowledges that at first he considered himself a most unlikely candidate to deliver this message. But the key lies in the music, he insists. “Music and art are the entrée to the divine message I have been asked to share. Consider this. More than a million people every month are listening to my music being played in retreat centers and spas across the world. Two generations of children have grown up listening to my music as a lullaby. Who knows how many of those children were conceived while their mothers and fathers were listening to my romantic music?” he quipped. “The book I wrote includes 90 minutes of my music through QR codes that you can access through your phone. Each one of these books is a transmitter of that heavenly energy through the vibrational sounds of the music, through the heavenly colors of the artwork, and the truth of what Jesus, Mother Mary and Mary Magdalena want people to fully know about their lives. “During my performances, “ he continued, “over 1,000 people have experienced Jesus. They have come forward voluntarily to say that during the concert they have connected with their loved ones who passed and many have also experienced healings. They also related that they had fun in dialogue with Jesus and that he has a sense of humor. “That was my experience as well when I first dialogued with him through channelers,” David recounts. He vividly remembers his initial conversation with him. All of the ascended masters: Jesus, Moses, Mohammed, Krishna, Buddha, etc. and the Archangels are on the same team. They like to be called “the heavenly team”. What people think of, as God, is actually a heavenly team because when people experience that huge light and God’s love and everything beyond, they’re not actually experiencing the Creator, they are experiencing the ascended masters and the archangels appearing to them as representatives of God. And they’re all on the same team. The point of the game is to win the game. And the way the game is won is by having more light-workers and positive people around the world contributing to the uplifting of humanity. Honored internationally for her interfaith activism and leadership, filmmaker/journalist Ruth Broyde Sharone is the creator of INTERFAITH: The Musical. 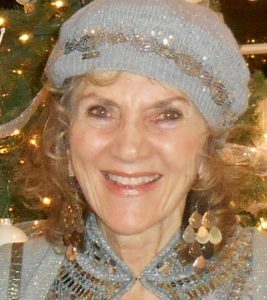 (interfaiththemusical.com) She pioneered ground-breaking interfaith pilgrimages to the Middle East in the 90s and served as Co-Chair of the Southern California Parliament of the World’s Religions for 10 years. Her documentary, God and Allah Need to Talk,and her interfaith memoir, MINEFIELDS & MIRACLES, have received multiple awards. She is a regular contributor to the on-line magazine,The Interfaith Observer, and also a co-author of the 2018 best-selling Amazon book, 21ST CENTURY VOICES: Women Who Influence, Inspire, and Make A Difference.